World Mushroom - Castle is the castle level of World Mushroom in New Super Mario Bros. 2. It is a level full of Whomps that attempt to crush Mario, along with Giant Spiked Balls that destroy everything in their path. The boss of this level is Larry Koopa. Completing this level unlocks World 3-1. Mario begins on a platform above spiky floors where a Giant Spiked Ball falls and begins to break the platform that Mario is on and chase after Mario. A Dry Bones then appear below ? Blocks, one of them containing a Super Leaf. Another Dry Bones appear, followed by several Thwomps above gaps in the platform. This is followed by a Big Dry Bones and several Big Thwomps. Further down are small and Big Whomps. Another Big Dry Bones appear before Mario reaches back to ground where the Giant Spiked Ball falls off. A large Whomp then appear next to the pipe leading to a small room. The checkpoint is found here with two small Spiked Balls bouncing on walls and the pipe to the next area. In the next area another large Spiked Ball will chase Mario once again. Bone Piranha Plants can be found here. A row of three ? Blocks can then be found, with a Super Leaf in one of them. Moving downwards, there are several rotating Brick Blocks located above several Bone Piranha Plants, where Mario needs to time his jumps. Another Dry Bones will appear, followed by normal ground, where the boss door is located. Larry Koopa is the boss of this level. In his room, there are four holes in the room (two in the ceiling and the floor), where walls move up or down. He jumps and shoots magic balls that bounce diagonally. After three hits Larry will be defeated, revealing the key to World 3. The player can use the walls to reach the key. Star Coin 1: This Star Coin is located under two breakable Brick Blocks after the second large Thwomp. 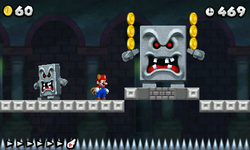 Super Mario can ground pound the blocks to obtain the Star Coin. Star Coin 2: When Mario reaches the pipe, he should ignore it and continue forward where the second Star Coin is. Star Coin 3: For the third Star Coin, Raccoon Mario is required. Upon reaching the boss door, Mario needs to charge the Power Meter so that he can fly. He needs to fly to an area above the boss door by flying left to where the spiky floor is (not directly up as there are one-way gates there), then upwards while keeping to the right wall to find a high ledge above. The Star Coin is located there. This page was last edited on April 13, 2019, at 08:44.